Fahnestock State Park is in Putnam County, just off the Taconic Parkway. It’s bisected by Route 301 which runs west until it ends at the Hudson River, in the quaint village of Cold Spring. Yeah, Fahnestock isn’t in Westchester, but it was a woodland walk, so I’m bending the rules here. 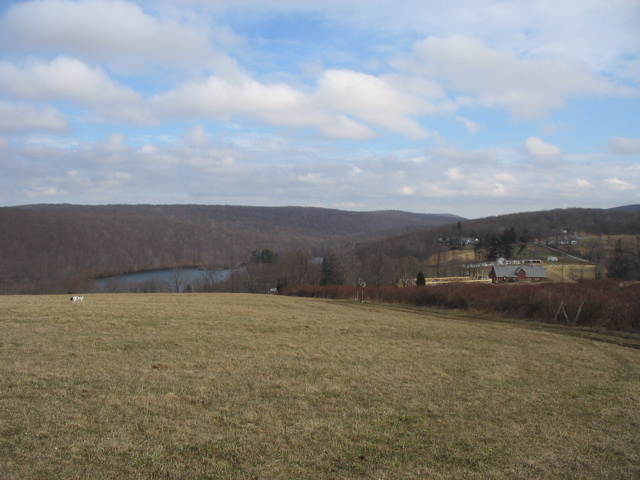 Fahnestock has 14,086 acres of varied terrain, and is a beautiful place to go for a nice long hike. The Appalachian Trail passes through it on its way to Maine, or Georgia. There’s also Canopus Lake which you can put your canoe or rowboat into (no motorized boats!) with a beach at the north-eastern end. The park also has a campground, where Lisa and I camped a few years ago. It’s not great camping, as you can hear the Taconic pretty clearly, but it’s pretty convenient for an easy night of car camping. 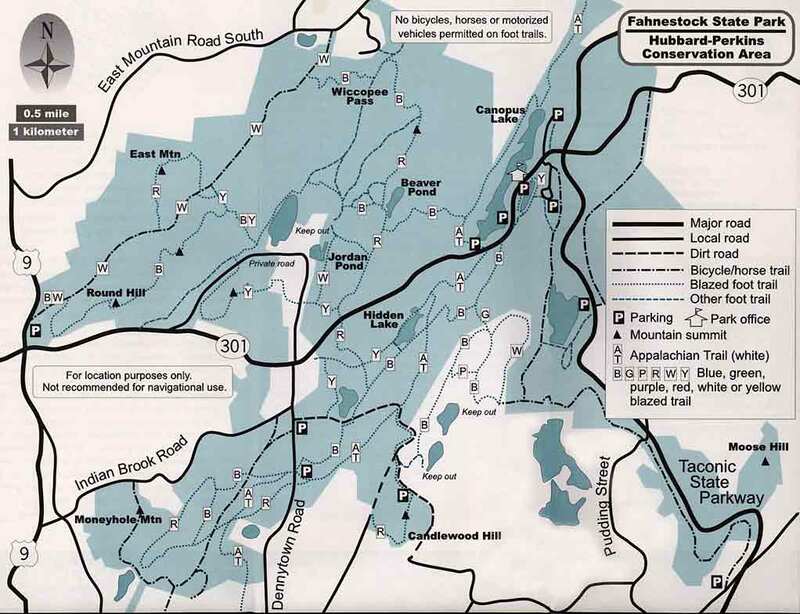 The New York-New Jersey Trail Conference has a great set of waterproof and tear-resistant trail maps for Fahnestock and the Hudson Highlands, as well as books and other resources. They also work to maintain these and many other trails in NY, NJ and CT. Visit their website for more information. 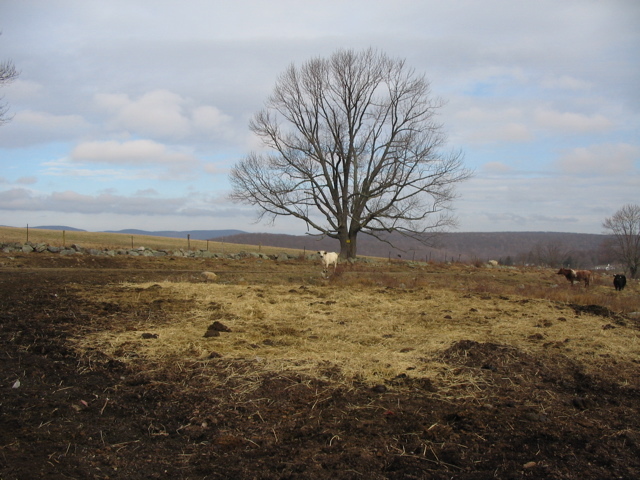 I found another map on the Putnam County News website. I’m not sure who made it, but it looks correct. It’s totally usable, but the maps the NY-NJ Trail Conference publish are much better in that they have topographical lines as well as much more detail. But in a pinch, this will work. 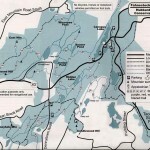 There are also maps available at the park office, just off Route 301. I strongly recommend carrying a map with you whenever venturing out into a park of this size. Even a seasoned hiker can get disoriented and lost. Having a map with you, and having the ability to read it, can get you back to where you want to be. You can waterproof the maps you print yourself by using clear packing tape on both sides. I do this often. 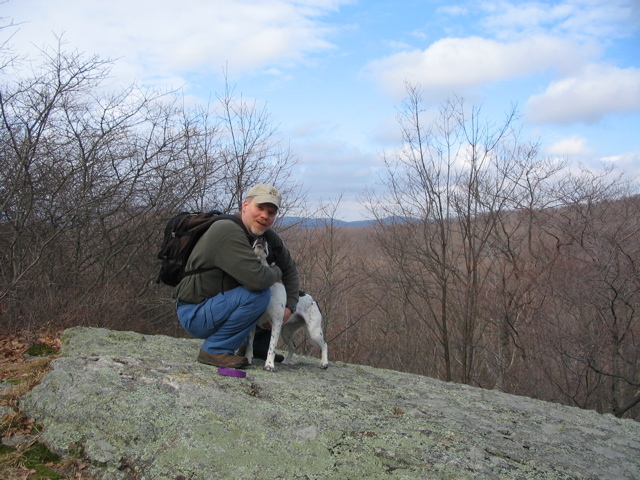 My old friend Matt (old in that I’ve know him for about 24 years) who lives nearby joined me for the hike and brought his dog Amelia. 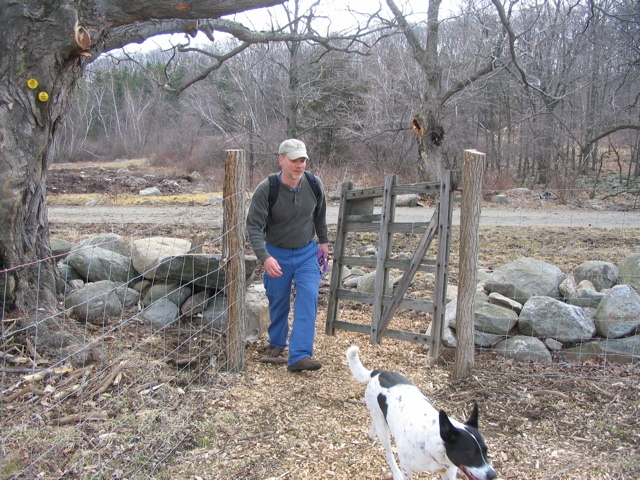 Fahnestock allows dogs if they’re on a leash no longer than 10 feet. 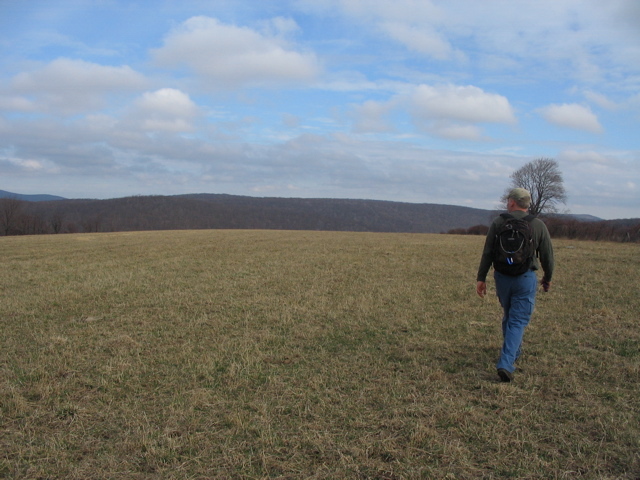 We decided that we wanted to hike about six miles total, so we chose a clockwise loop on the north side of Route 301 that was roughly that length. 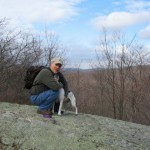 We parked at a roadside parking area which is about 4 miles from the Taconic. You’ll notice it because of the paved pull-off areas on both sides of the road. 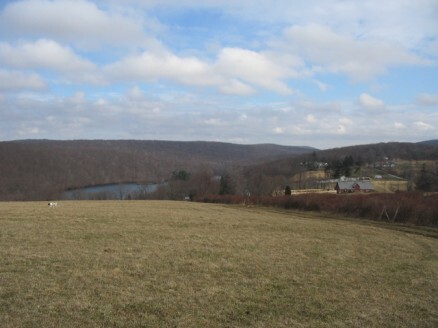 The trail then crossed the fields, which afforded us some great views of a horse farm and lake. It’s great that the land owner allows the trail to cut through the field. 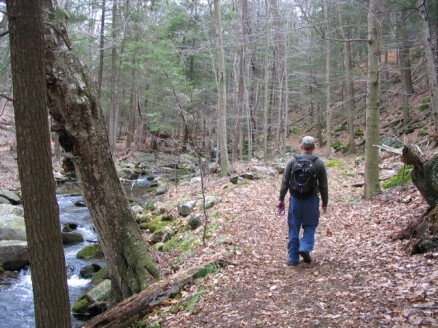 Afterward, we followed the top of a ravine, then looped around to follow the river that cut the ravine. 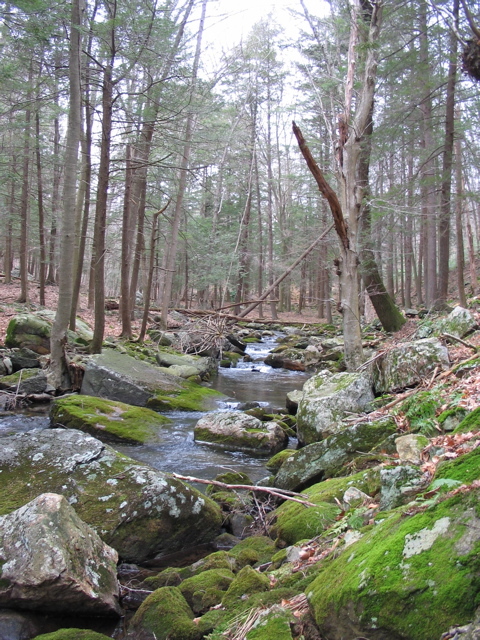 The stream was flowing and clean, and looked very inviting. Another lake that we passed. There were about three total on this loop. 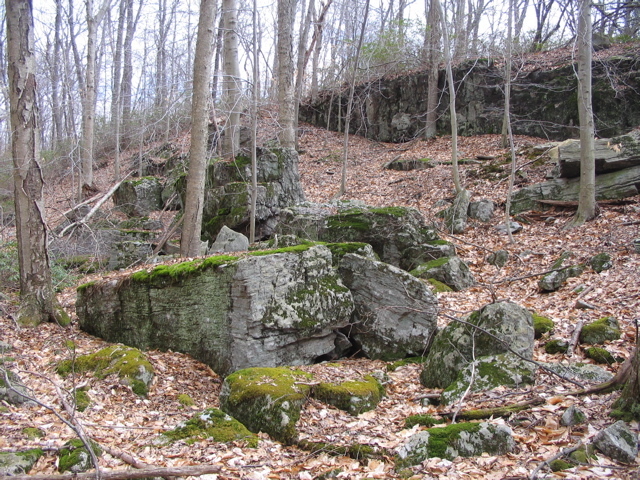 Some great, big rocks, that appeared to have calved off of the cliff to the right. 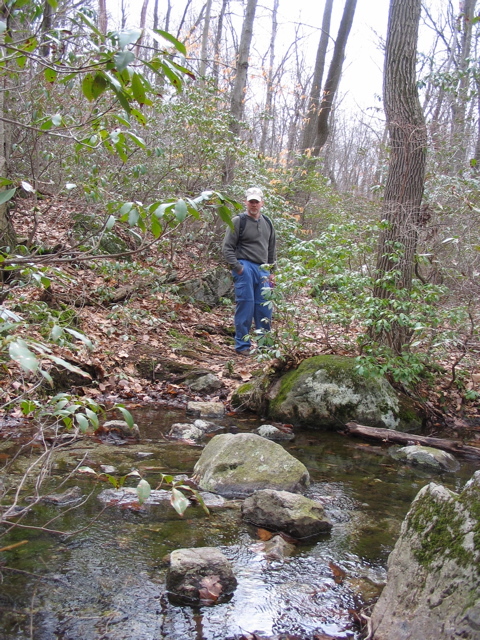 It was a very nice hike, with mild weather. 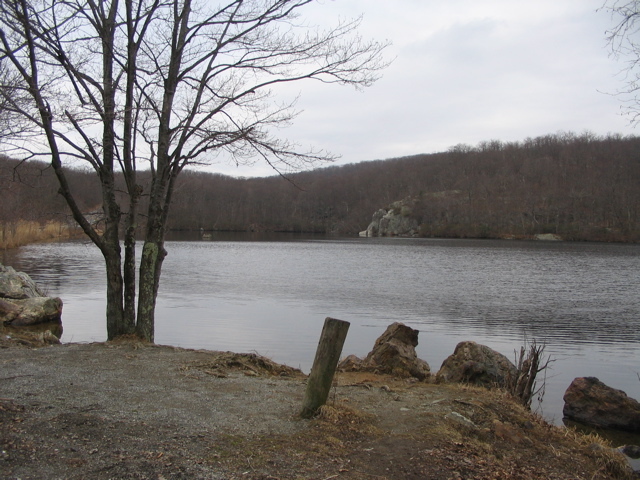 Fahnestock State Park is a great place to go, and is large enough that you can explore many different areas on multiple visits. Enjoy! 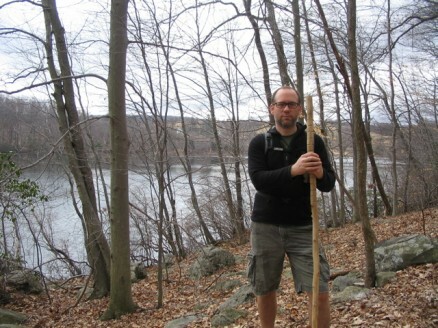 This entry was posted in Fahnestock State Park, Hikes and Walks on March 28, 2009 by Alex Smoller.